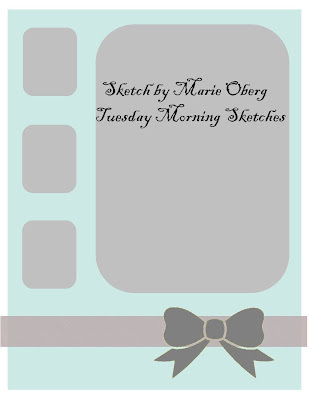 Welcome back for another fun sketch at Tuesday Morning Sketches. The Ribbon Carousel is our wonderful sponsor this week. If you haven't visited their shop...you're missing some really great ribbons and fibers. 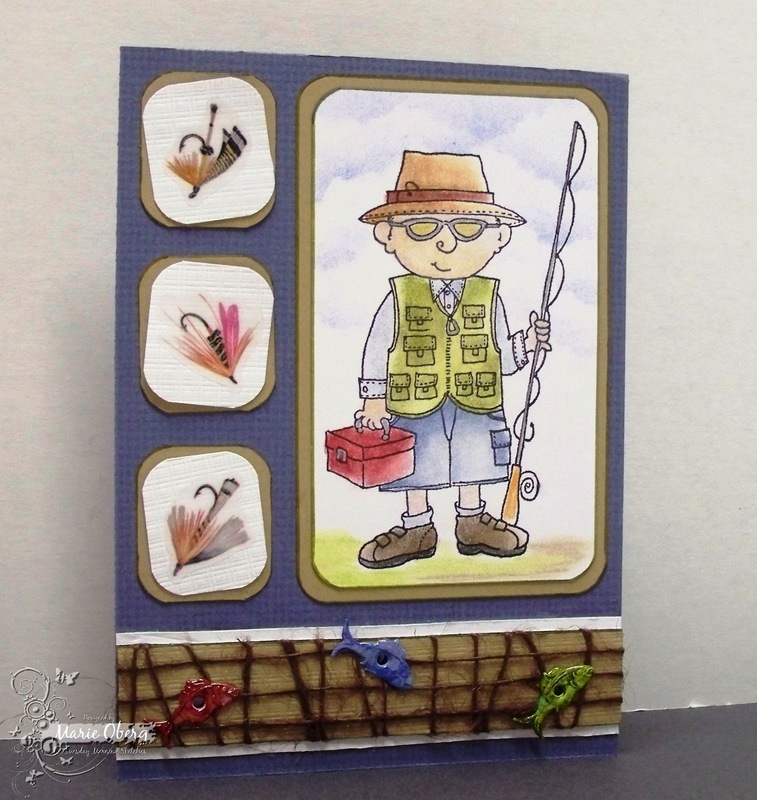 This cute fisherman is an Inky Antics stamp that I colored with Prisma colored pencils and blended with Gamsol. 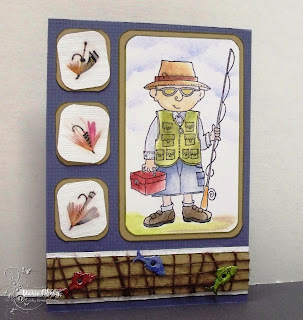 I don't have any fishermen in my family so finding embellishment for this adorable image was a challenge in itself! 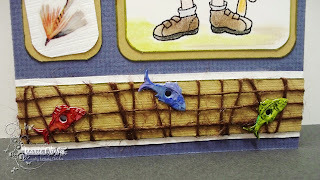 The 'fish hooks' are actually stickers that were placed on the paper then embossed with a PTI embossing plate to give them a little texture and to camouflage the sticker edges. The fish are 'quickset eyelets' from the Eyelet Outlet. If you have ever given up on setting eyelets, you don't know what you're missing. These little cuties are set with a ball point pen. Check them out...there's even a demo! The netting that the fish are escaping from was made with jute from the Ribbon Carousel. As many of you know I am determined to fill a basket with men's cards, so I don't have to make one every time I need one! I'm not too crazy about ribbon on a masculine card and you can only used so many buttons, so this jute was a perfect fiber for embellishing my masculine cards. (I bought about 6 different masculine colors of jute....shhh...don't tell my DH). Please play along for a chance to win a great prize from The Ribbon Carousel...beside the prize...show me what you can do with the sketch I designed! Still practicing these sketches! Back to creating cards in my Butterfly Garden. Really nice card Marie you did a great job tfs!!! What an awesome masculine card!!! Fantastic sketch, too!! I hope to have the time to play along this week! I love it! I can't believe the fish hooks are stickers! Too cute! Marie, LOVE this card! Smart of you to emboss to hide the sticker edges! Most of all I LOVE the jute net with the fishies!! Really cute...love the fun eyelets...great layout too! Marie, this card is just too cute! Fantastic coloring and you are always so stinkin' creative with all your embellies! Love the fish hooks and flies, and the "net" you created is perfect!!! So cute Marie! Love the fish net! So adorable. This is great Marie. Love the jute and fish eyelets, cool touch. Another great sketch from you, too! This is one fab man card !! I love the fun fisherman and the cool flies and and net with the fun fish! This card is absolutely incredible. New follower here LOVE your cards! What a fun card! I love the netting on it with the fishy brads. I hope your trip to Daytona was a good one. What a fun card! The fishy brads are just too cute. Fabulous coloring. Love that sky. I am a wife, mother, grandmother and paper crafting addict. Working with paper crafts is a great way to de-stress, is cheaper than a psychiatrist and a lot more fun.